September 28, 2011 | By Chrissy | Filed in: Inside Scoop. Congratulations to Ashley and Brillians who were 4th overall in the Large Junion Hunter Older Section by placing 1st in the under saddle, 4th in over fences, and 7th in the handy hunter. 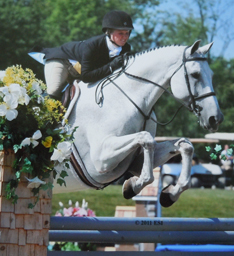 Congratulations to Kendall and Viaggio for making it into the 2nd found of the USHJA Hunterdon Cup and being 13th. Also, congratluations to Kendall and Wilhelm for winning the Marshall Sterling Hunter Classic at week 6 of HITS. Congratulations to Catie with Harvey Davidson, Emily with Finnegan, Kendall with Axl Rose & Viaggio, and Olivia with Picasso on qualifiying for the Finals! Way to go Catie and Harvey Davidson for placing 5th in medium children’s hunter pony and 11th in pony equitation. Way to go Kendall and Axl Rose for placing 3rd in the $7,500 children’s jumper classic and 4th in the $2,500 children’s jumper class. And to Kendall and Viaggio for placing 8th in the PHA Equitation Finals. Check out Ashley’s news article! Congratulations on making Virginia Intermont College’s riding team and good luck! Congratulations to Kendall on qualifying for the medal final. Good luck! Good luck to all riders, horses, and ponies. Have fun! Remember to check the cork board in tack room for a list of horse shows to attend this fall.